A prayer line is available to all parishioners in times of emergencies, tragedies and special need. When you call, a prayer leader receives the request and triggers calls to all of the parihioners who have expressed their willingness to pray for others in the parish. The prayer line enables those who are working, as well as the sick and disabled the opportunity to participate in the life of the parish community. 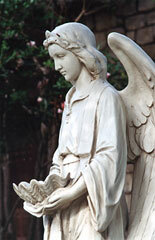 To request a prayer or to join the prayer chain, please contact the parish office at (361)993-4053.